First time, my photo to be appeared as a big cover. 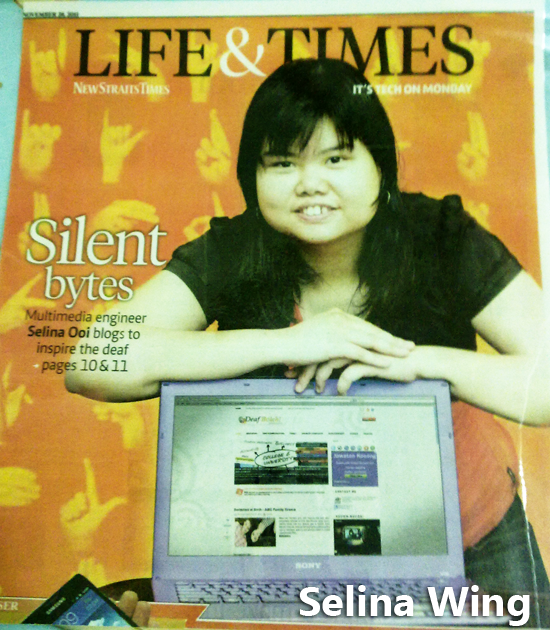 My story get double pages in the New Straits Times (NST) newspaper on 28 November 2011!! I am shy! :P I am really like thank to Rozana Sani, a reporter of Tech, Life & Times! She is very friendly and nice when I met her at NST office. I also love to visit around her big office NSTP so cool! Please visit their website at http://www.nstp.com.my/. I learned much from her about the editors need to write alot and find some creative idea to do new story. They also need to know what news will be happen on tomorrow. They are very busy when they cover on their story on everyday! My mom and I enjoyed to talk with Rozana Sani. I am really anxious when a photographer took some photo on me in the studio! My mom also joined me to take photo together! I am happy to see my grandma, dad, aunt and sisters in my story! My story is very long? :P I am excited and informed my relatives and best friends to read this newspaper too! Thank you to my family and friends who support me for this blogs! My Deaf friends always share alot of information and events with friends in Facebook. I learned many things from Deaf community Malaysia. So, I sure willl write the interesting article for you all because it help to increase Deaf and Hearing's awarnese in Malaysia. meow~ thank you! I enjoyed to read your comic from akiraceo.com! :D I like it!